They lived in the shadow of the mountain – the girl Iliana and her tribe. The mountain was the Poás volcano in the colorful country of Costa Rica… thus begins a legend told by the locals around Poás. Well, the girl was not sacrificed to Poás, and yet, the mountain did not destroy the people living around it. Why? Perhaps Poás so far has been a well behaved volcano. 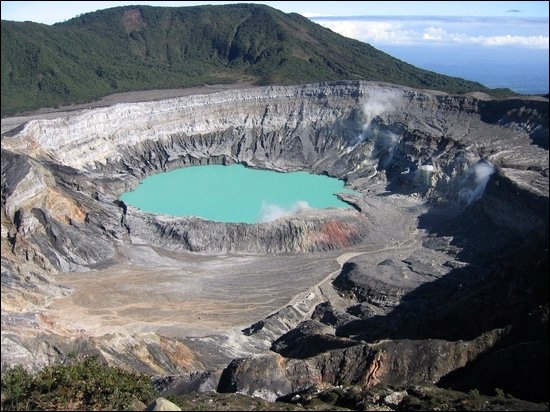 People around it were thriving, and thanks to amazing craters, spectacular views, and easy access, Poás Volcano lives now within the most popular National Park in Costa Rica, with over 250,000 visitors yearly. Less than two hours’s drive outside of the capital San Jose, with paved roads leading up to the crater, it also claimes to be the most accessible volcano in the world. 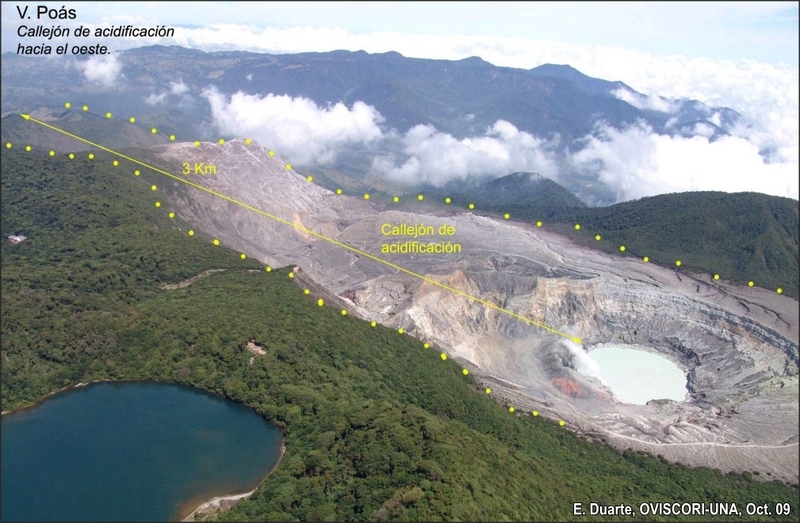 The seismicity in the Poas volcano is still low, no phreatic eruptions recorded since October 2014. The few earthquakes recorded are of small amplitude and low frequency. Tremors were recorded sporadically but with low frequency and short duration. 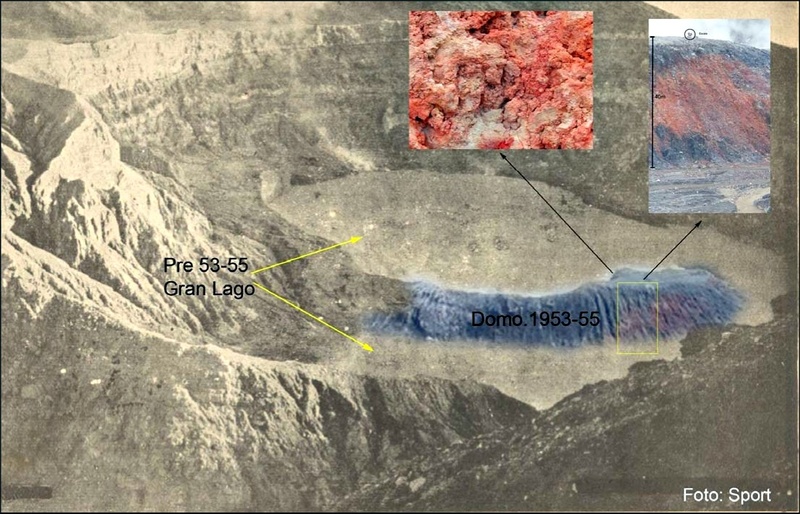 The ultra acid lake showed a decrease of 0.6m without temperature increase or significant variations in the acidity (pH) and the content of ions in solution. In August, the temperature of the lake recorded around 31.5°C and the pH measured under laboratory conditions was pH = 0.28. Monitoring gas temperature shows dome fumaroles approx. at 350°C. The flow of SO2 measured is 120 ± 50 ton/day. – There is a trend of higher values of CO2/SO2 in the fumaroles, and a larger difference exists between the composition of the gas fumaroles and of the lake. Scientists reported that in general there have been just minor changes in and around the crater since their last visit two years ago. – Despite the high phreatic activity, the lake water level has risen; this is related to abundant rains in the previous months on the tops of the Volcanic Sierra. – Fumaroles and geyser-like vents that were producing lots of steam at their last visit had dissapeared since – mainly due to burying by rockfalls and inundation by the rising lake water. – Regarding the temperatures encountered in the dome: they have fallen ostensibly compared to previous years. Western dome fumaroles keep temperatures around 90°C. On top, hotspots were found with 80°C, while in the area adjacent to the lake the hottest spots barely exceed 120°C. 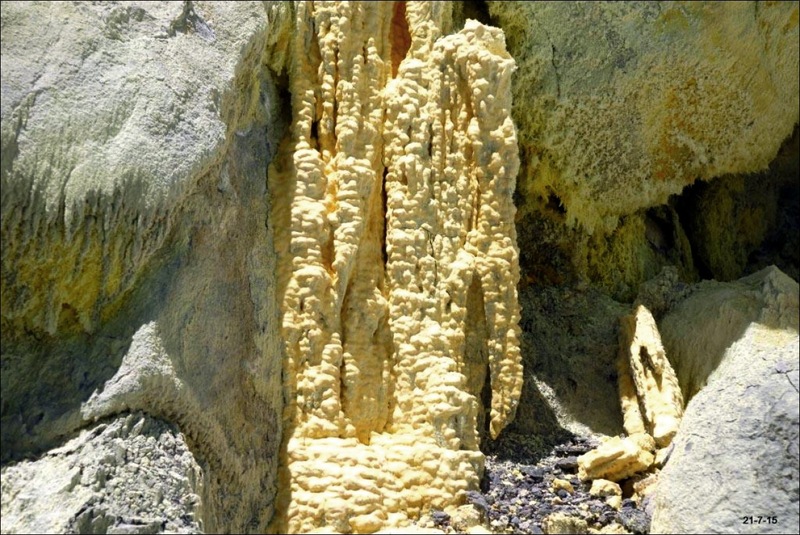 However, they must have been hotter until a few weeks ago because there are samples of native melted sulfur forming small bright yellow waterfalls (image above!). The Poás massif consists of several eroded calderas, cones, and crater lakes at or near its summit. A N-S-trending fissure cutting the 2708-m-high complex stratovolcano extends to the lower northern flank, where it has produced another volcano, Cerro Congo, abt. 3950(?) BCE. A bit further down are also eight water-filled maars. 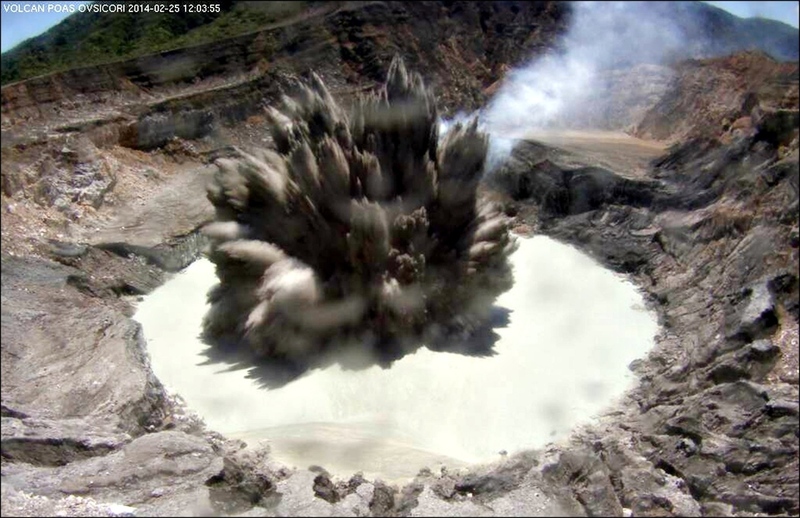 Those were created by a spectacular phenomenon: when larger amounts of groundwater came in contact with magma or hot lava, steam formed rapidly, virtually blowing up the ground and leaving a hollow which later filled up with water. Poás’ summit contains three craters along the N-S line, two of which contain lakes. The northernmost, or main crater, is the most interesting feature of Poás (~1.7 km wide, ~300 m deep, 2300 m a.s.l.). It is the presently active crater containing Laguna Caliente (=hot) – one of the largest lakes of acidic brine on Earth. It has erupted at least 39 times since records began in 1828 and is in a state of nearly continuous mild activity. Most of its eruptions are phreatic. Some explosions eject material up to a few kilometers above the lake. The lake (and steam) is very acidic, pH can be less than 1 (0.28 in a recent report). Temperatures as high as 95°C (203 F) have been measured at the crater lake, but at times it has only just over 20°C (68 F). In 1989, the crater lake at Poás gradually drained completely away. Later, researchers found a pool of liquid sulfur instead, about 2 m (6 ft.) in diameter; the sulfur probably came from former fumarole deposits. 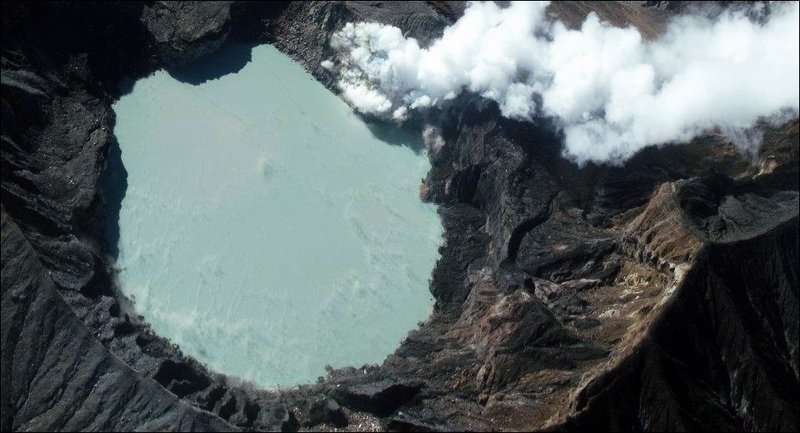 This was the first observation of a liquid sulfur lake on the surface of Earth. Fascinating is the diversity of colors of the lake: it might be emerald green now but three hours later – grey-whitish. At times rafts of brilliant, yellow sulphur are seen floating in the lake. 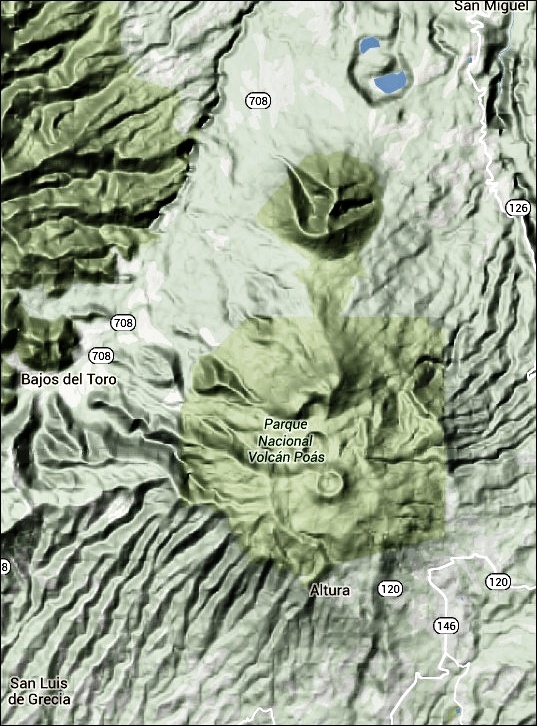 Further south and one step higher, the Botos cone forms the 2708 m high point of the Poás volcanic massif. From there, focus shifted to the presently active crater about 5600 years ago. The 1-km-wide Botos maar is filled by a coldwater lagoon sometimes known as Laguna del Fría or Laguna del Poás. The water in this lake is mostly cold and clear, in contrast with the hot, extremely acidic lake of the main crater, but sometimes gets heated up by several degrees through hydrothermal activity. Photo above: In the foreground Lake Botos. Gas rises from the Laguna Caliente north of it. A UK Ebayer apparently sells the “Illustrated London News” page-wise (£18 each + £8 postage! What a shame!). 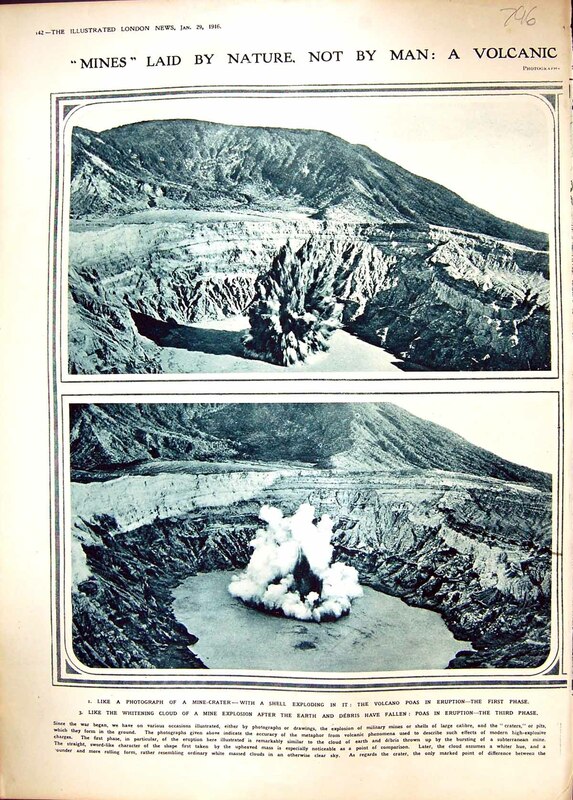 It’s dated 1916 and in the text below it describes the likeness of the eruption with a bombshell hit. That’s war times for you! The origin of the dome goes back to an intrusion between 1953 and 1955. Before that eruptive period, there was one Great Lake (Gran Lago). Following that episode the lake was literally split in two. The flat side south of the dome is a feature (shaped wall) that has been severely eroded by gravity, high temperature, small eruptions and runoff. 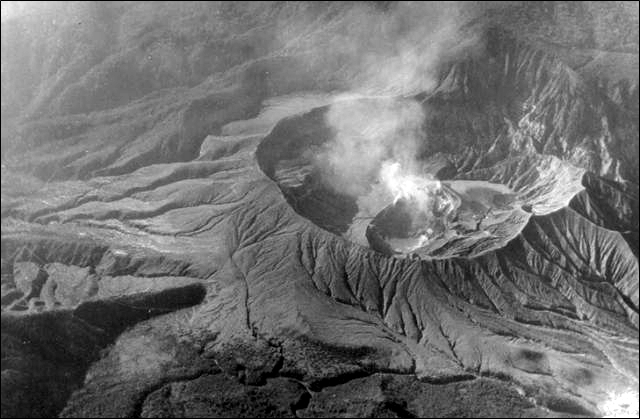 In June 1956, steam rises from a new circular sub-crater formed in the summit crater of Poás during an eruption from 1952-57. It began with phreatic explosions increasing in intensity from 1952 to early 1953. By May 22 1953, the crater lake was vaporized. Then slabs of lava appeared in the crater in 1957. © Jorge Barquero (Universidad Nacional Costa Rica), 1956. 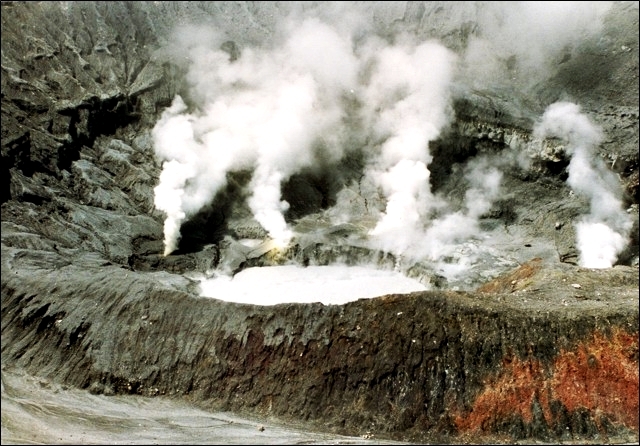 1994: After a quieter period, minor phreatic eruptions producing steam to heights of several meters were first reported in March 1994. Intense gas emission in the ensuing months caused health problems and severe economic losses in agricultural areas. Ash eruptions formed a small new crater. 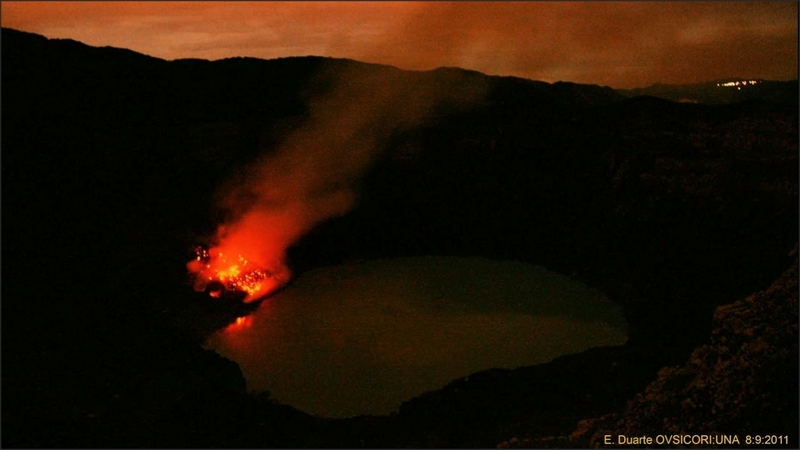 The crater lake ( seen here September 2, 1994) returned, and minor phreatic eruptions took place in October. Photo by Jose Enrique Valverde Sanabria, (courtesy of Eduardo Malavassi, OVSICORA-UNA). 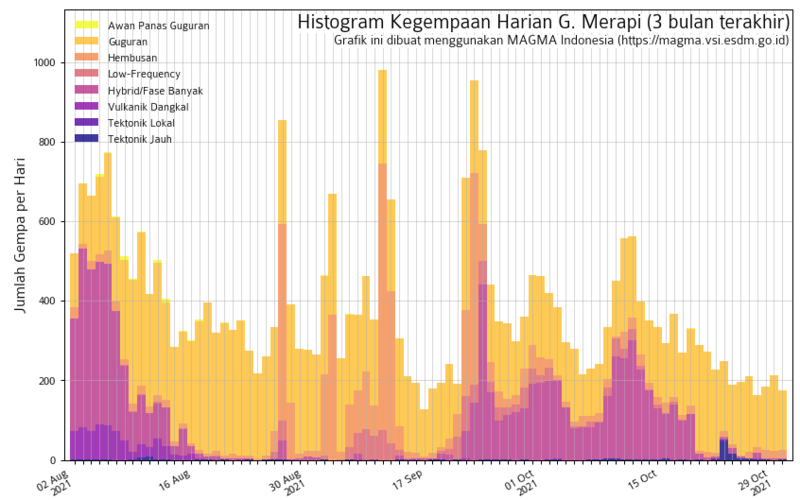 2009 Earthquake and Eruption: A large earthquake (mag 6.1) occurred at Poas volcano on Thursday 8th January 2009. 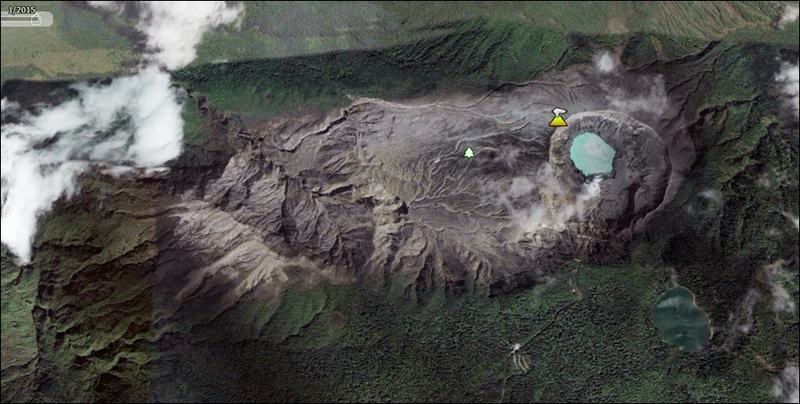 The epicentre was located 8 km east of the volcano summit. 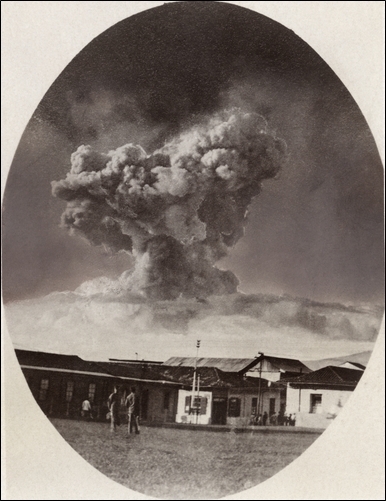 The same day a phreatic eruption occurred at the summit lake, ejected ash and steam 600 m above the lake. After the volcanologists visited Poas in 2011, they published their research on incandescence and some stunning photos of it: The growth of the overheated rock extended to ~80m (from the lake to the dome top). Incandescent mass was focused on the north wall of the dome (on the opposite side of the classic view tourists have from the viewpoint). The center of the affected area had some points where combustion flames are showing continuously changing color, although the power is relatively constant. Some of those flames reached up to 8m hight. (Text interpretation and images from: Localización y Escala de la Incandescencia en el V. Poás, 08/2011, Field work and writing: E. Duarte, OVSICORI). Night view from the east side of the crater. The lights to the west (upper right) correspond to a community, about 15 km away from the volcano. Acidification, caused by volcanoes, leaves indelible marks in their environment; temporary and permanent. Sometimes they can leave acidification alleys (stretches, trajectories) for decades, characterized by bare soil and vegetation withered or totally burned. 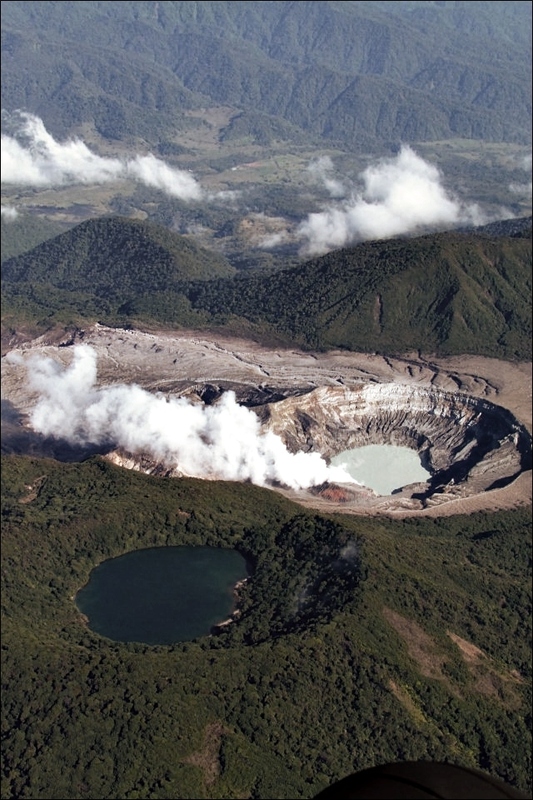 In Costa Rica, acidification is a common ocurrence to volcanoes like Rincón de la Vieja, Poas and more recently, Turrialba. The total or almost complete absence of vegetation is a reliable indicator of stringent conditions of volcanic degassing. Sometimes highly resistant species survive temporarily. Also, because of their location at the top of the volcanic massif these affected alleys are subject to high winds and erosion. Only during periods when the gas activity abates, moss and lichen species begin gaining ground again thus producing conditions for other species pioneering the revitalisation of the area. The affected land is rocky, hard and has no ability to develop organic soil in the absence of vegetation. Coincidentally, often the same effects are incured by falling material (pyroclastic ashes) that sterilizes the ground quickly by burying, burning or acidification. This sterile substrate inhibits the rapid progress of species that might develop healthily a few dozen meters away, where conditions are less drastic. The presence of gases and their flow characteristics are critical to understand these avenues of acidification. The volcano’s activity, often in intermittent periods, produces extraordinary impairments. Dry or wet contacts can cause different burns in plant tissue. Factors as the presence of aerosols (solids dissolved in gas) and particulate matter (solids suspended in air) increase injuries of the vegetation. 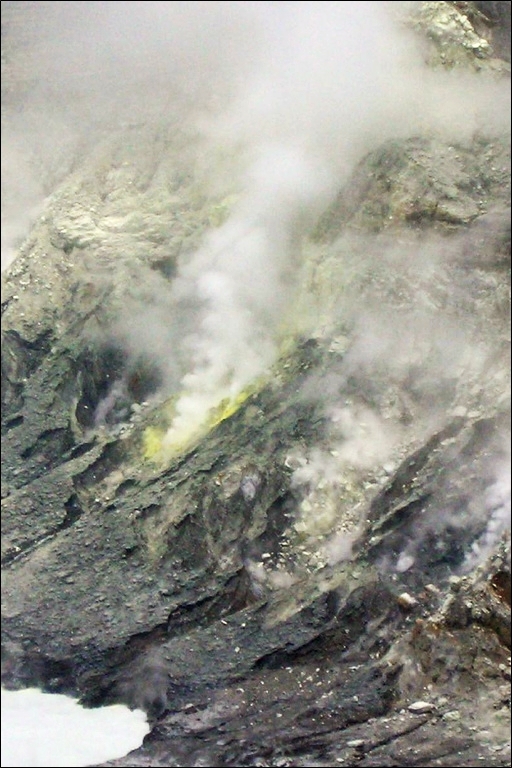 The most common damaging volcanic gases are: C02 and S02; smaller quantities of corrosive acids may be mentioned: H2S, H2, CO, HCl, HF, and Helium (He). Also, climatic aspects like the the predominant wind direction and the continued presence of moisture (rain, drizzle, fog) in volcanic peak times promote impact acceleration by acid rain. In some areas a constant presence of acid rain with acidity values between pH 3 and pH 5 is observed. Google Earth imagery clearly shows the denuded ground west of the crater. In the case of Poas volcano this alley is most easily identifiable by the visitor. This unique sector reaches from the lookout on the left (west) to the Cerro Pelon and towards the Plains del Toro. Descriptions of the first and curious researchers agree that the devastated area has been there for centuries. More recently, the more dramatic type of phreatomagmatic eruptions began to affect that avenue at the beginning of the 1950s with bombs, pyroclastics and ash falls. Many of the observed blocks up to 1.5km away from the main crater are intact and they have not shown any plant roots. …around Poas? It’s absolutely futile to start on Flora and Fauna, because Costa Rica boasts 6% of the world’s biodervisity. I’ll just grab two examples that struck me as interesting. Charles Darwin (again! 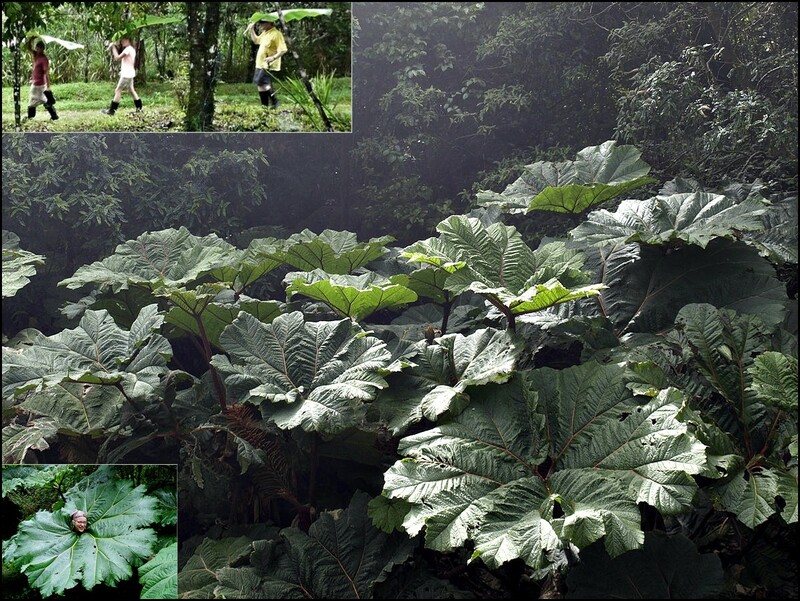 ), when exploring the island of Tanquil in 1834, noted the “noble” Gunnera: “I one day noticed, growing on the sandstone cliffs, some very fine plants of the panke (Gunnera scabra), which somewhat resembles the rhubarb on a gigantic scale. The inhabitants eat the stalks, which are subacid, and tan leather with the roots, and prepare a black dye from them. The leaf is nearly circular, but deeply indented on its margin. I measured one which was nearly eight feet in diameter, and therefore no less than twenty-four in circumference! The stalk is rather more than a yard high, and each plant sends out four or five of these enormous leaves, presenting together a very noble appearance.” (Voyage of the Beagle, Chap. XIII). Gunnera plants have an interesting property: they form a symbiosis with nitrogen-fixing cyanobacteria. The bacteria enter the plant via glands found at the base of each leaf stalk and initiate an intracellular symbiosis which is thought to provide the plant with fixed nitrogen in return for fixed carbon for the bacterium. Of the 79 species of birds resident in Poas National Park alone I am most impressed with the Resplendent Quetzal (Pharomachrus mocinno) for its striking appearance and the part it is playing in mesoamerican folklore. They shimmer from one shade to another, blending almost magically with their green homes. 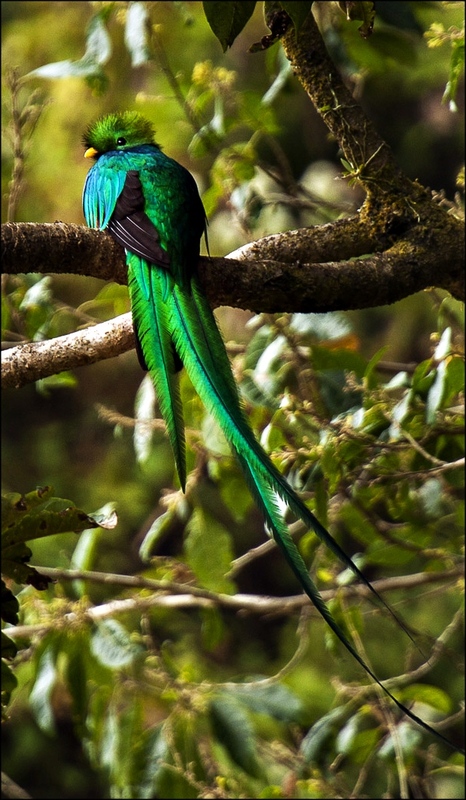 Their color seems ephemeral for a reason; quetzals are not green at all. It’s hard to believe, but quetzals are actually brown. They are colored by melanin, the same pigment that causes tanning in humans. Highly magnified, quetzal feathers are alternately translucent and dark brown. The magic comes from melanin pigment stripes regularly spaced 5,400 angstroms apart causing interference that “traps” most colors of light but only reflects the green light, which then bounces back to your eye. Quetzals were important symbols to the Aztecs and the name comes from their word quetzalli for the tail-feathers they used ceremonially. These legendary tail feathers that can be ca 70 cm long are one of the salient traits of the male Resplendent Quetzal. They lived in the shadow of the mountain – the girl Iliana and her tribe. 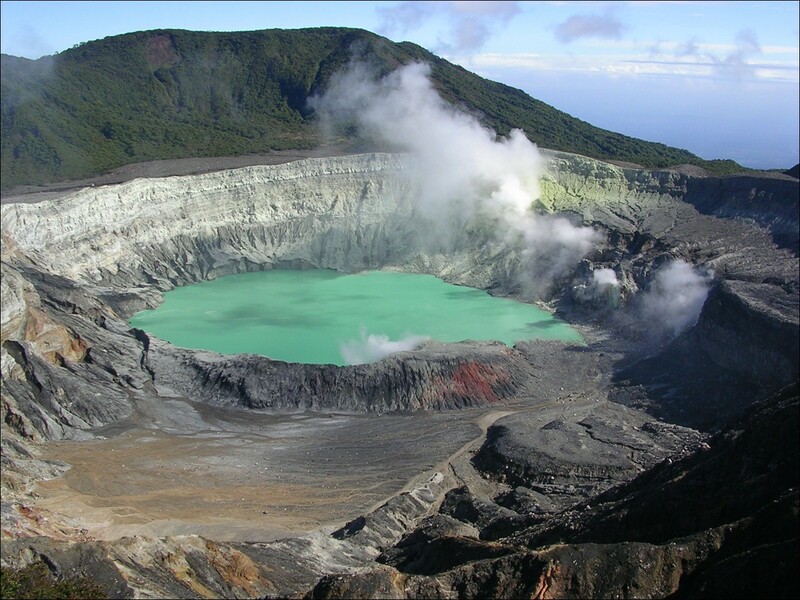 The mountain was the Poas volcano in the colorful country of Costa Rica. And Iliana’s father was the shaman of his people. Poas Mountain was clothed in rich green vegetation. Many beautiful birds and butterflies made their home there. It seemed that the great God above had smiled on this mountain and made it as a home for the tribe. But there were stories that told of the wrath of Poas, times when the mountain would spew forth fire and lava. Then all life was destroyed in flame and molten rock. These stories were very disturbing to the shaman, but Iliana did not trouble herself with such things. 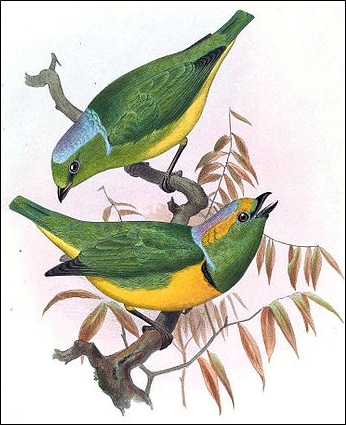 Iliana had befriended a rualdo – a bird with plain plumage but an enchanting voice. Its beautiful songs cheered Iliana every day. No matter how ill or sad she might be from time to time, the song of the rualdo could bring a smile to her face. And the rualdo loved Iliana dearly, for she had once saved his life. Lately Poas had been smoking and grumbling, and the shaman feared the worst for the people of his tribe. Day after day he would watch and listen… and the fear inside him grew. At last the shaman climbed the mountain to the smoking crater and looked down into the abyss. “Why are you threatening my people?” he cried. “What will it take to make you stop?” In a deep growl, the mountain spoke to the shaman. “Bring me your daughter for a sacrifice, and all will be well with your people.” The words of Poas cut the very heart of the man. “My daughter? She is my only child. Please… isn’t there anything else we can offer?” But the mountain spoke no more. Days passed, and the smoke grew thicker, and the rumblings became louder. At last, in desperation, the shaman journeyed again to the top of the mountain, this time with his daughter, bound hand and foot. The rualdo followed at a distance. He watched in horror as, with a loud groan, the shaman was about to throw his daughter into the mouth of Poas. He was heart-broken. With no thought for himself, he flew into the smoking core of the volcano and offered a trade – his song for the life of the girl. And then, even with the sulphurous smoke burning his throat, the rualdo sang his most beautiful song for Poas. He sang about friendship and faithfulness and of the beauty of his native land. As he sang, the rumbling ceased, and Poas began to weep. The mountain wept so much that his tears became the great Botos Lagoon. The rualdo, alas, can never sing again, for his voice was destroyed in the fire of the mountain, but he was given bright plumage as a gift for his courage. But most importantly, his sacrifice had saved the life of his friend. Great post, Granyia! Now, a question. What is the ‘dome’ always mentioned in Poas’ crater? It’s obviously not a ‘dome’ in the sense of say St Helens or Sinabung, but most sources I’ve seen are a bit vague about what it actually IS. It sounds like what they call a cryptodome; ie a shallow intrusion that has forced the crater floor upwards without breaking through to the surface, but if that’s the case why not say so? And if that’s NOT the situation, what is it? Thanks Michael! This is a question that has bothered me a lot when I collected the material, so I decided not to mention it at all in the post. 🙂 Indeed, reports from OVISCORI-UNA, as well as some scienfic papers call it a cryptodome. Other papers consistently use the term dome. GVP says: “On the S edge of the lake is a dome (that OVSICORI-UNA sometimes in their reports refers to as a ‘cryptodome’), …”. It seems to me that we have here a conflict of opinion among scientists. In the Spanish caption of one picture from 2011, the “El Domo” is set in quotation marks while other features are not. Actually, I have found so much interesting material on Poas that I was thinking to do a part 2, covering the more scientific aspects of the volcano. But for that, I have to understand first what I’m writing about 😉 … maybe I will put the Dome question on Eriks blog. 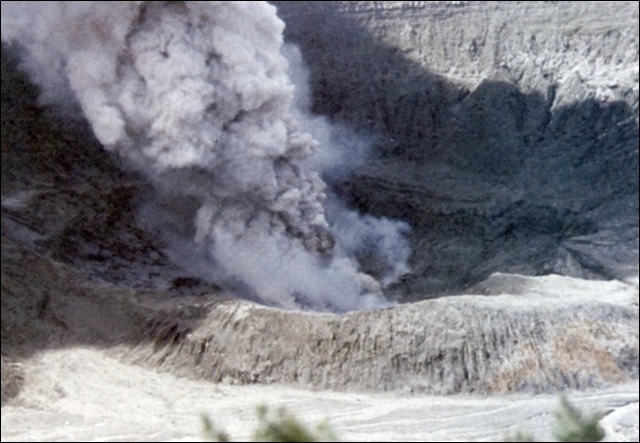 I have this mental picture…a small pod of magma sitting under the crater for decades (centuries?) slowly cooling and degassing; not so much a melt as a mass of red-hot glass,. Add the effect of acid gases and hydrothermal action (lot of groundwater because of the heavy rainfall) and you have a situation where there is no sharp boundary between ‘magma chamber’ and existing structure, but a gradual transition from magma, to solidified magma, to solidified magma with increasing degrees of alteration, to the acid-marinated sulfurous mud of the crater floor. If some of this semi-moribund magma is squeezed upwards, there will be a bulge on the crater floor… but is it a dome by definition? Omg, wherever you look, it’s all flooding, fires, storms, landslides and so many people dead, injured, lost their homes etc. ; you really don’t want to read any more Job’s news! I hope our beloved volcanoes keep at bay for the time being!